Swarms of common house flies are infesting homes in parts of Warwickshire, prompting an environmental health investigation. Some people in Brinklow, near Rugby, said their homes had been plagued for "over 12 weeks." One resident said he squashed 35 flies in one hour, while another said she once came home to find 100 dead flies. Rugby Borough Council said it was looking for sources which could cause "a breeding pile". Meanwhile, people are using plastic band catapults, Venus fly traps and smoke bombs to try to keep the numbers down. Homes in Brinklow, Bretford, Binley Woods and Stretton-under-Fosse have been affected. Faye Gaplin, who has a 10-month-old son, said: "We tried fly tapes, but it wasn't working so I bought industrial smoke bombs. I let one off and when I came home there were 100 dead flies. "My son can't sleep as flies keep landing on him, and at night I'm just sat watching telly and constantly wafting flies away". David and Marlin Jones, also from Brinklow, are using elastic bands to squash and kill flies. Mr Jones said: "I squashed 35 flies in over an hour by pinging elastic bands." 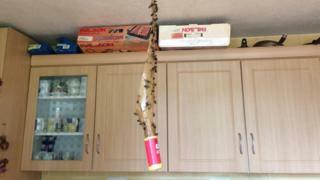 Mrs Jones said: "In 41 years of living here we haven't seen an infestation like this." Sean Lawson, head of Environmental Health at the council said: "We visited several commercial businesses and agricultural premises, none of which identified or provided any sort of source for those levels of flies." Spikes in fly population can occur when manure is spread and stored, Mr Lawson said. He added: "We are looking for several sources."